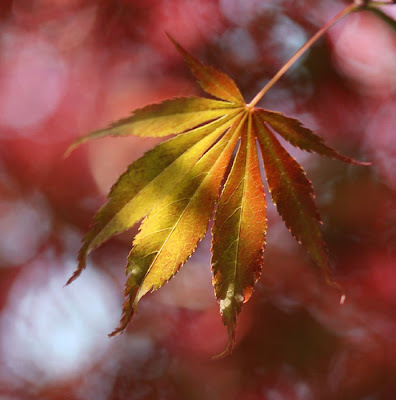 Plant Avenue: Can You Grow A Japanese Maple From A Cutting? Can You Grow A Japanese Maple From A Cutting? I love Japanese Maples! We have one in our back yard, and I'd love to have one in the front as well. I hadn't even considered the option of propagating a new tree from a cutting, until I stumbled upon the idea here. I surfed around again and found more info here. I think I'm definitely going to try. I'll have to look at our tree to see if there is any new growth I can clip to use - otherwise I might have to wait until spring. Use a cutting from new growth, between 6 and 8 inches long. Cut at an angle where a leaf meets the stem. Remove all but the last two or three leaves. Dip in a rooting hormone (such as Rootone). Put cutting in moist perlite. Maintain humidity (seal in plastic, or mist regularly). Place somewhere with good light. Once roots have appeared (about 8 weeks later), you can then move the cutting out doors, if you allow it to gradually adjust to the new temperature. Plant in the ground at least a month before the first frost. Rooting japanese Maples is rather difficult. As well as the difficulty with the actual formation of the roots is the fact that even after successfully forming roots, the trees usually die within a few years. If you need more info before you begin, try looking at Bonsai websites. I have seen a few that mentioned being successful. I think you're right - I've heard other people say that as well. So far the cuttings I've taken have survived in water for a few weeks and then died without sprouting any roots (mind you, these cuttings were taken in the fall - I have yet to try spring cuttings).